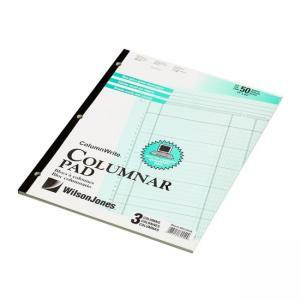 Columnar pad contains 50 sheets of heavyweight, green-tinted bond paper for pen and pencil writing. Pages are ruled in brown and green ink on both sides. Sidebound columnar pad features a chipboard back, flexible Pressboard cover and three-hole punched design with 1/4" diameter holes.